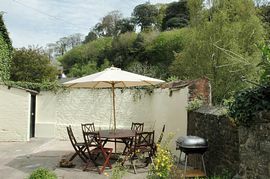 Chimney Cottage is a charming, grade II listed, 17Th century thatched cottage near the old Mill in Dunster, with a South-facing courtyard garden. 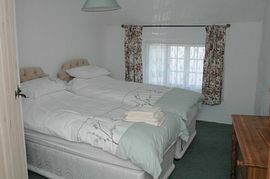 The cottage offers high quality spacious accommodation for 6. There are three bedrooms (one with en-suite shower room, one with en suite WC and wash hand basin), a family bathroom, a sitting room and a large kitchen. 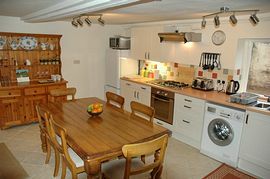 Facilities include Sky TV, DVD player/recorder, washer/dryer, dishwasher, fridge/freezer, WiFi broadband Internet access. There is an enclosed rear porch, which provides storage for boots, coats and a couple of bikes. Private off-street parking. Full details including floor plans can be seen on our website. South-facing courtyard garden with table for 6, sunshade and barbecue. Outside toilet. 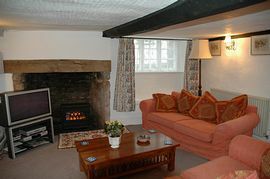 Local Services: Several pubs, restaurants and essential shops within walking distance. Supermarket 2 miles. Go through the village, through a set of traffic lights into West Street. Chimney cottage is on the left towards the end of West street a couple of houses before the Forester's Arms. 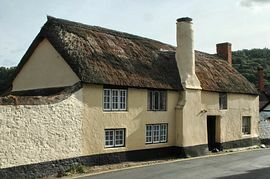 It's easily identified by the thatch roof and round chimney (the only one in Dunster). "Thanks for all your help - it's a fantastic building in a perfect location."